This constellation is unique, for it is divided into two parts – Serpens Caput, the head, and Serpens Cauda, the tail. Nevertheless, astronomers regard it as a single constellation. 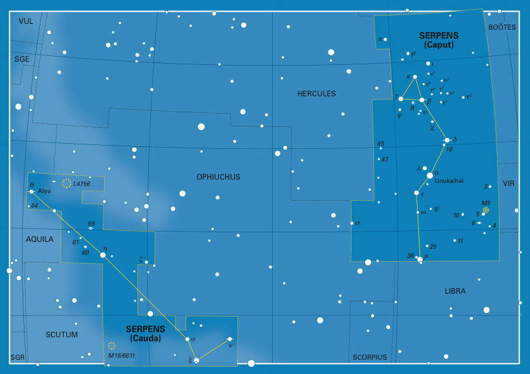 Serpens represents a huge snake held by the constellation Ophiuchus. Its Greek name was Ὄφις (Ophis), but in the Almagest Ptolemy gave it as Ὄφις Ὀφιούχου, i.e. the serpent of the serpent-holder, presumably to prevent confusion with the other celestial serpents Draco and Hydra. In his left hand Ophiuchus grasps the top half of the snake, while his right hand holds the tail. Aratus and Manilius agreed that Serpens was coiled around the body of Ophiuchus, but most star atlases show the snake simply passing between his legs or behind his body (for an illustration of the full tableau, see Ophiuchus). In mythology, Ophiuchus was identified as the healer Asclepius, a son of Apollo, although why he appears to be wrestling with a serpent in the sky is not fully explained. His connection with snakes is attributed to the story that he once killed a snake that was miraculously restored to life by a herb placed on it by another snake. Asclepius subsequently used the same technique to revive dead people. Snakes are the symbol of rebirth because they shed their skins every year. 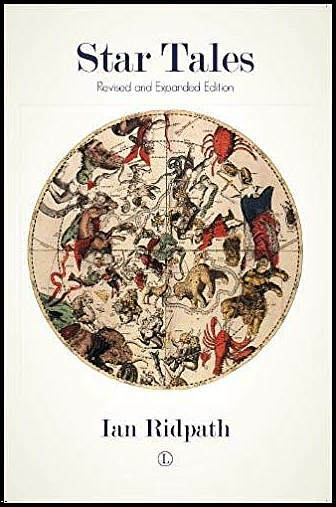 Ptolemy in the Almagest listed the stars of Ophiuchus and Serpens as separate constellations, but mythologists such as Eratosthenes and Hyginus dealt with them together. One of the few celestial map makers to show Serpens separately was Johann Bayer, who devoted a page of his atlas to each of the Ptolemaic constellations; however, the snake also appeared in more shadowy form on Bayer’s chart of Ophiuchus. Other major celestial chart makers such as Hevelius, Flamsteed, and Bode followed the mythologists in treating Ophiuchus and the snake as a composite figure, with the snake partly obscured by the body of Ophiuchus. When Eugène Delporte came to define the official constellation boundaries in the late 1920s, he was faced with the problem of how to separate the intertwined figures of Ophiuchus and Serpens. His solution was to chop Serpens into the two halves that we see today, the head on one side of Ophiuchus and the tail on the other. The head is by far the larger half, covering an area over twice that of the tail (428 square degrees against 208). From the western border to the east, the official boundaries of Serpens span nearly 57° of sky, just over half the length of Hydra, the water snake, which is the largest constellation of all. Serpens as it appears on a modern star chart by Wil Tirion. Mouseover the image to see the outlines of each half. The constellation’s brightest star, third-magnitude Alpha Serpentis, is called Unukalhai from the Arabic meaning ‘the serpent’s neck’, where it is located. The tip of the serpent’s tail is marked by Theta Serpentis, called Alya, an Arabic word that actually refers to a sheep’s tail. The most celebrated object in Serpens is a star cluster called M16, embedded in a gas cloud called the Eagle Nebula, which takes its name from its supposed resemblance to a large bird of prey. The Eagle Nebula was the subject of a famous photograph by the Hubble Space Telescope showing pillars of gas and forming stars. The stars of Serpens were seen by the ancient Chinese not as a snake but as two halves of a wall enclosing the celestial marketplace, Tianshi. Most of Tianshi lay in Ophiuchus and southern Hercules. Theta, Eta, and Xi Serpentis formed part of the left (east) wall of Tianshi, while Gamma, Beta, Delta, Alpha, and Epsilon Serpentis were part of its right (west) wall. For all its size, there were relatively few Chinese constellations in present-day Serpens. Omicron and Nu Serpentis were part of Shilou, a six-star loop representing a hall or tower that housed the market office, most of which was in Ophiuchus. Sigma Serpentis and Lambda Ophiuchi formed Liesi, representing an arcade of jewellers’ shops. The single star Mu Serpentis was known as Tianru, ‘celestial milk’, symbolizing rain but also said to represent the mother or wet nurse of the crown prince.